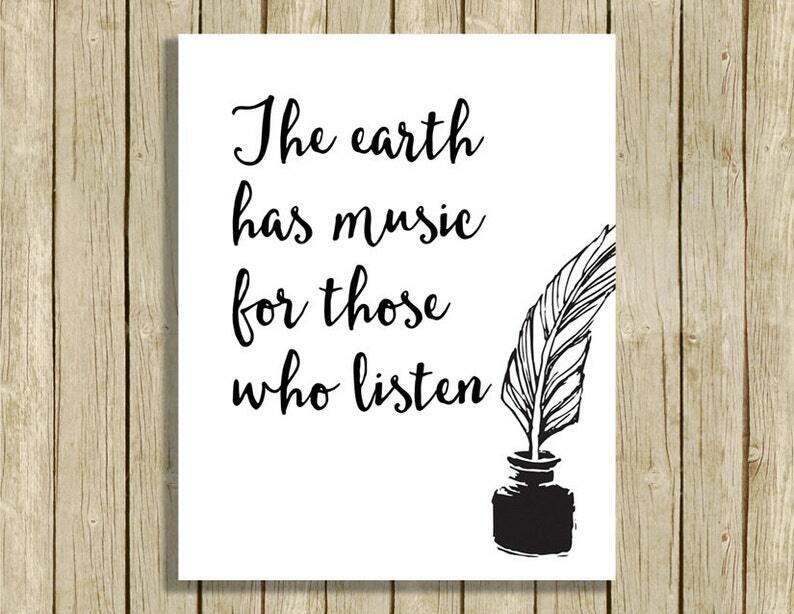 Printable literary quote 'The earth has music for those who listen'. Often mistakenly attributed to William Shakespeare - sorry to disappoint but he didn't say it. You will receive an 8 x 10 inch 300 dpi JPEG file without the watermark which, once downloaded, can be printed as often as you like. This is a digital file for INSTANT DOWNLOAD so no need to wait! Once you have purchased your item simply click on the Download Files button for instant access or download it later via your account. All prints are for personal use only. This means that you may use them yourself or give them as gifts but they can not be resold in digital or printed form. Bought this for a collage wall for my bedroom. It looks great! We accept PayPal as well as credit and debit cards, Etsy gift cards and some other international payment methods. Due to the digital nature of these items they can not be returned but if you have any problems please get in touch and I will do my best to help. As soon as you make a payment you can download your item via the link on the payment page. You will also receive an email from Etsy with a link to the download. Remember you can download the item as often as you like for personal use by logging in to your account on Etsy at anytime in the future.